I might have a slight obsession with cookbooks. I just counted my cookbooks for the first time, and I have 54. That's not too many...is it? True, they no longer fit in the bookcase, but that doesn't mean it's an excessive number. It just means the bookcase is too small. Anyway, in all seriousness, even though I love cookbooks and have 10 more on my Amazon wish list, I almost never buy those wish list books for myself. The cookbooks I buy myself are usually from yard sales or the library book sale, and cost around $2 each. Usually these are books that I hadn't heard of before, but end up loving after flipping through them. And it's hard to beat such bargains! A perfect example is The Accidental Vegetarian, which I picked up at the Somerville library book sale a couple weeks ago. As soon as I got home, I went through it cover to cover and tagged about 10 recipes right away. This Moroccan spaghetti was particularly appealing to me because with the exception of the herbs, it uses all pantry ingredients. Perfect for that time before the summer produce really hits the farmers' market shelves. This recipe jazzes up a basic tomato sauce with cinnamon, cumin, turmeric, parsley, cilantro, and mint. Chickpeas and almonds bulk up the dish and add protein. It's a pretty simple recipe that makes a nice change from the standard weeknight spaghetti dinner. I can't wait to try more recipes from this book, especially with all the great local produce that is going to be arriving soon! Cook spaghetti in a large pot of well-salted water until al dente. Drain and set aside until sauce is ready. While spaghetti cooks, heat oil in a large saucepan over medium heat. Add onion and garlic and cook until onion is golden brown, about 10-12 minutes. Add the tomatoes, cinnamon, cumin, and turmeric and bring mixture to a simmer. Simmer for 10 minutes. Stir in the chickpeas, almonds, and herbs and season the sauce to taste with salt and freshly ground black pepper. Toss spaghetti with sauce and serve. 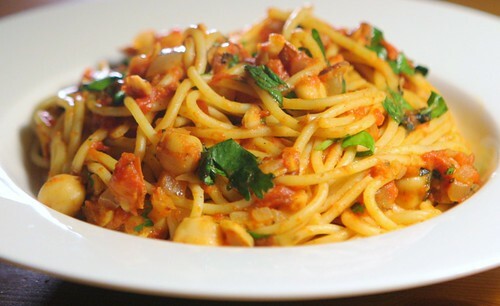 I like the addition of chickpeas and herbs in this spaghetti. It looks really good. I think I need to get a hold of that book because "the accidental vegetarian" describes me perfectly these days! This spaghetti looks so interesting...I never would have thought to add almonds to pasta! I wish I could say that I only had 54 cookbooks...but that would be a lie. :P And now I think I need one more...because this spaghetti sounds amazing! I love the MOroccan-spiced sauce! I've been to Morocco and loved the kitchen there. I suspect that I would love this dish as well! Looks delicious! What a cool spin on spaghetti!